Located in the heart of Lower Manhattan*s Battery Park City the Conrad New York is a contemporary all-suite luxury hotel. With magnificent views of the Hudson River this exceptional hotel is adjacent to Hudson River Park in close proximity to many of the city*s most iconic and historic landmarks and such as the National September 11th Memorial Museum Statue of Liberty Wall Street and the trendy neighborhoods of TriBeCa and SoHo. The Conrad New York offers a new standard of luxury featuring 463 spacious guest suites that average over 430 square feet each outfitted with integrated technology two flat-screen HD televisions and individual climate control as well other unparalleled in-room amenities. Sixteen stories above street level the hotel features a striking seasonal rooftop bar providing stunning views of the Statue of Liberty and New York Harbor. The hotel boasts over 30 000 square feet of adaptable meeting space including the 6 200 square-foot Gallery Ballroom. Danny Meyer*s Union Square Events is the exclusive food and beverage partner of the hotel*s onsite conference and event facilities. 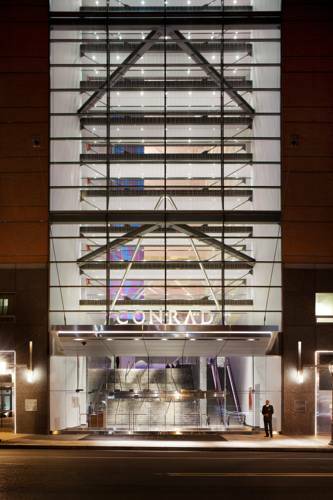 The Conrad New York has proudly achieved Leadership in Energy and Environmental Design /LEED/ Gold certification. ATRIO poised in the center of the hotel*s stunning 15-story atrium lobby crafts Mediterranean cuisine in the most sophisticated fashion a delicious departure from the ordinary.